Founded in 2012, Fawn Shoppe is an online boutique for children’s apparel and accessories. The boutique provides parents with timeless classics with up-to-date patterns, crisp cutting-edge designs, and top-quality pieces with a trendy feel. 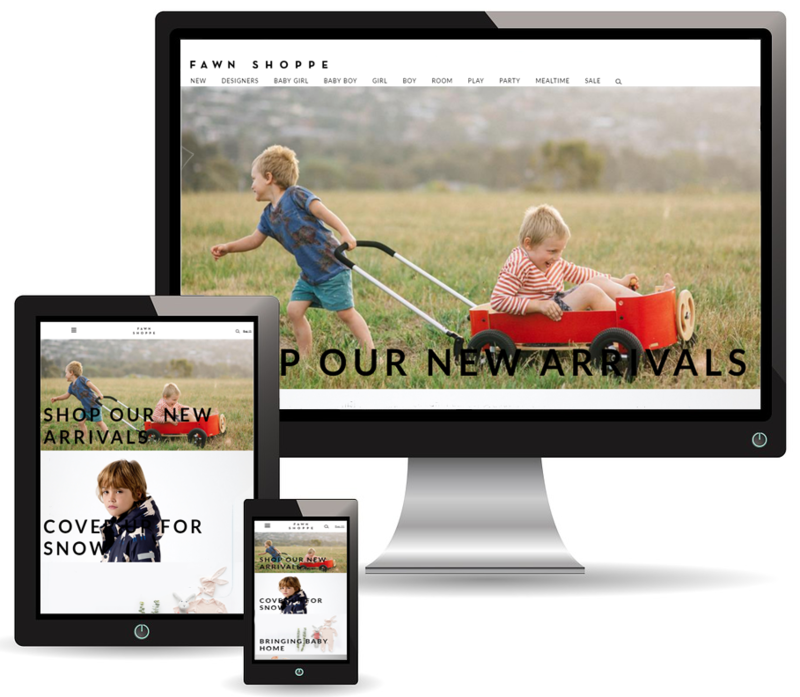 Fawn Shoppe took their core design values and incorporated them into their eCommerce Magento store. The Fawn Shoppe site was operating on a non-responsive and highly customized theme built by a previous developer. The site was experiencing issues due to complicated and overwritten code that disabled Magento’s basic functionality. Due to the code issues, Fawn Shoppe administrators could not properly manage product filtering, categories, attributes or on-screen menu items via the Magento admin. Fawn Shoppe tasked InteractOne with enhancing and updating the design of their site as well as upgrading Magento to resolve customization issues and restore basic functionality. InteractOne successfully upgraded FawnShoppe.com with a new custom theme that includes: infinite scroll integrated with separately-scrolling filters and a persistent header; retina-ready responsive code; a custom layout of the ‘my account’ section; a custom layout of the shopping cart and checkout pages; a color-switching header; and a custom search bar integrated into the header design. The Fawn Shoppe upgrade included a custom design with a unique UX/UI focus. InteractOne was sensitive to Fawn Shoppe’s brand that provides high-end, design-oriented children’s clothing, furniture and accessories. We knew that attention to detail and an uncluttered design for Fawn Shoppe customers was critical to their business. Therefore, we ensured that our design details focused on superfluous elements that were then eliminated or hidden. In addition, InteractOne didn’t just focus on visual design. We resolved error messages and focused on button and process description text to ensure the new site had a clean and consistent tone through every step of the user purchase path. Through the discovery and upgrading process, our developers discovered many more features of Magento that had been disabled by previous developers. We successfully restored those issues while applying security patches and integrating updated extensions. We relied on trustworthy extensions from the best in the Magento Marketplace including: IWD – infinite AJAX scroll; uRapidFlow Pro; Mirasvit HelpDesk RMA; and RocketWeb Shopping feeds. With their upgraded Magento site, Fawn Shoppe has the speed and flexibility of Magento as well as properly integrated custom development. InteractOne was careful to implement a mobile-friendly design that focuses on improved UX including improved product filtering, navigation, search and a smooth customer purchase path. Throughout the first few months of having a new mobile-friendly theme, Fawn Shoppe experienced exponential increases in both mobile conversion rate and per session value. It started with the bounce rate improving by 13% and average session duration increasing by just over 4 minutes. As a result of the improved user experience metrics, Fawn Shoppe’s eCommerce conversion rate (a per session value on mobile devices) has doubled in value from the month before the new theme launch through February 2018. Per the graph above, the eCommerce rate and per session value had become recumbent prior to the site upgrade. Increasing the mobile conversion rate from 1.31% to 2.82% gave Fawn Shoppe more confidence when sending more mobile traffic to their site. In turn, Fawn Shoppe saw an increase in the average order value and more than quadrupled the number of monthly transactions and revenue. In addition, Fawn Shoppe has regained control of default Magento functionality. Prior to working with InteractOne, they needed to consult with a developer before updating or changing the site. Now they have the ability to update aspects of their site that were previously hard-coded or unavailable through the Magento admin, such as the top navigation, layered navigation, and merchandising elements. If you are interested in learning more about how InteractOne can help you with your new Magento website, please contact us or call 513-469-3345.